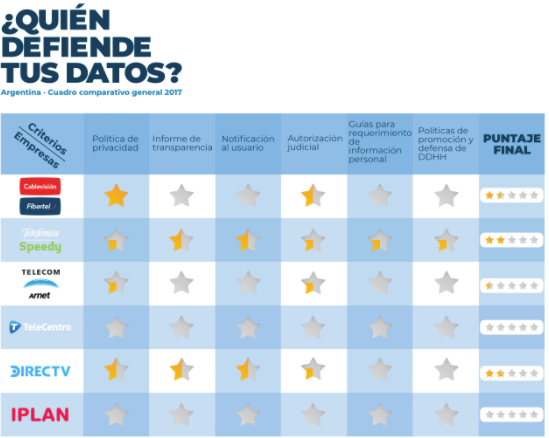 Argentina's ¿Quien Defiende Tus Datos? (Who Defends Your Data?) is a project of Asociación por los Derechos Civiles and the Electronic Frontier Foundation, and is part of a region-wide initiative by leading Iberoamerican digital rights groups to turn a spotlight on how the policies of Internet Service Providers either advance or hinder the privacy rights of users. The report is based on EFF's annual Who Has Your Back? report, but adapted to local laws and realities. Last year Brazil’s Internet Lab, Colombia’s Karisma Foundation, Paraguay's TEDIC, and Chile’s Derechos Digitales published their own 2017 reports, and ETICAS Foundation released a similar study earlier this year, part of a series across Latin America and Spain. The report set out to examine which Argentine ISPs best defend their customers. Which are transparent about their policies regarding requests for data? Do any challenge disproportionate data demands for their users’ data? Which require a judicial order before handing over personal data? Do any of the companies notify their users when complying with judicial requests? ADC examined publicly posted information, including the privacy policies and codes of practice, from five of the biggest Argentine telecommunications access providers: Cablevisión (Fibertel), Telefónica (Speedy), Telecom (Arnet), Telecentro, IPLAN, and DirecTV (AT&T). Between them, these providers cover 90% of the fixed and broadband market. Evaluation Criteria for ¿Quién Defiende tus Datos? Transparency: whether they publish transparency reports that are accessible to the public, and how many requests have been received, compiled and rejected, including details about the type of requests, the government agencies that made the requests and the reasons provided by the authority. Notification: whether they provide any kind of notification to customers of government data demands, and bonus points if they do the notification apriori. Judicial Court: Whether they require the government to obtain a court order before handing over data, and if they judicially resist data requests that are excessive and do not comply with legal requirements. Law Enforcement Guidelines: whether they publish their guidelines for law enforcement requests. Companies in Argentina are off to a good start but still have a way to go to fully protect their customers’ personal data and be transparent about who has access to it. ADC and EFF expect to release this report annually to incentivize companies to improve transparency and protect user data. This way, all Argentines will have access to information about how their personal data is used and how it is controlled by ISPs so they can make smarter consumer decisions. We hope next year’s report will shine with more stars.